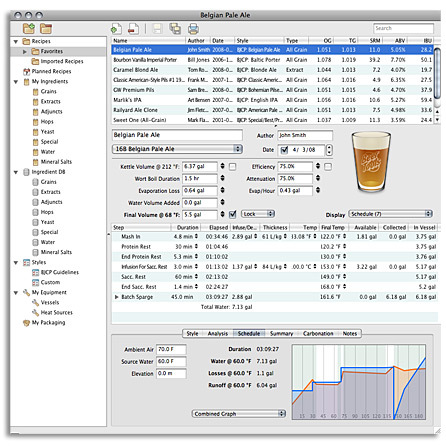 BeerTools Pro 1.5 (BTP) is now available for purchase. The process of buying and downloading this powerful brewing application will take only a moment or two. The time needed to start using the application will also take only a few minutes. The ease of set up and use reflects the huge amount of time that went into developing this ground breaking application. The programing of BeerTools Pro started over eight years ago. Our goal was to develop a foundation and infrastructure that would easily adapt to future growth. BTP takes the advanced science of brewing and distills it into an easy-to-use interface. The engine that runs BTP is designed to be intensely flexible when handling calculations. An example of this might be in the carbonation utility which enables you to calculate your volume CO2 from the priming sugar weight, OR you can calculate your priming sugar weight from the CO2 volume. The example of the carbonation utility illustrates the value of making the application handle reverse calculations. The easy-to-use interface belies the complexity that operates beneath the surface. Independent unit selection means you are able to have various portions of your recipe in different units of measure. So if you want your grain to be in metric units and your adjuncts in U.S. units- no problem. "Our goal was to develop a foundation and infrastructure that would easily adapt to future growth." Another early decision was to develop the application for Mac and PC simultaneously. This seemed like a logical step since there was little support for the Mac among brewing applications. With the help of a great team of French speaking brewers we were also able to create a French* localization of BeerTools Pro. This is accessed by setting your default language in your computer. * User Guide is only available in English. With the popularity of brewing software came a problem. The problem was that users of one application were unable to use the recipe files of the other's applications. While BeerTools Pro does write its own kind of XML file, it also supports the importing of BeerXML. This means that you can open your recipe files created by other applications effortlessly on BeerTools Pro. The instant you start using BeerTools Pro you will notice the visual aspects of the application springing to life. The beer color indicator isn't a static "swatch" sample, it's a continuous scale for more realistic color visualization. The style graph, in the results portion of the window, gives you instantaneous updates about how ingredient changes effect your accuracy to style. You will see the subtle differences between styles materialize right before your eyes. The main portion of the session window is the multi-list. The multi-list holds the ingredients as you add them. Ingredients can be easily organized by dragging them up and down. Sometimes you may want to only see certain types of ingredients (i.e. only have grains visible). This is easily done by choosing the display selector beneath the beer glass. There you can isolate all the ingredient types. The display selector holds the key to the multi-list's power. You will notice that the multi-list displays information for many different aspects of your brewing process. Easily switch from the profiles for your equipment to the various steps in your brewing schedule, and then view volume adjustments or packaging increments - all within the multi-list. Once your beer has been made, it needs to be "packaged" by being placed in bottles or other storage vessels. BTP has a built-in packaging tool which quickly determines how many bottles (or any vessel for that matter) it will take to store your batch. The display selector helps keep the application free from looking cluttered and confusing. The mash designer enjoys the ease of use that the multi-list offers. Schedule steps are easily arranged and re-arranged by dragging them up and down. If you have the schedule graph visible while working on the steps you will see the graph instantly reflect your changes. It is also interesting to leave the schedule graph visible and switch the multi-list to the ingredient view. You will notice how slight changes to your fermentable ingredients impact the schedule. The world of IBU formulas can be a mystery to many brewers. All that changes with BeerTools Pro. The IBU editor allows you to see what these formulas actually look like. Now you can compare the popular formulas used by brewers the world over. Best of all, you can take those formulas and tweak them to suit your taste. 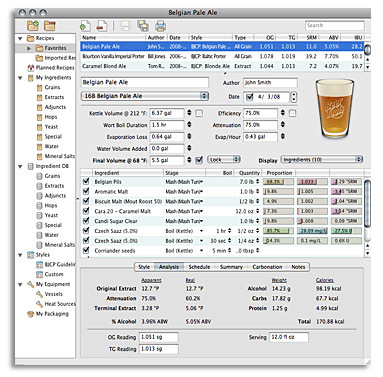 The IBU editor allows you to use the formulas for boil time, gravity correction, and pellet type hops correction. You can use these by author or mix-and-match the formulas. 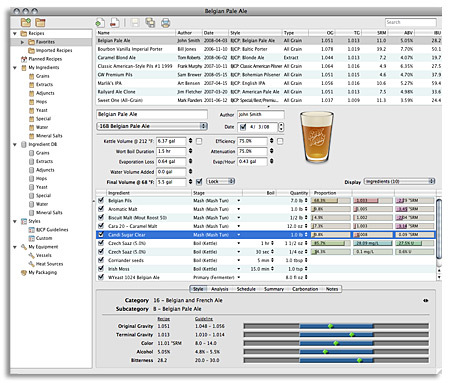 Since water is critical to brewing, BeerTools Pro brings some useful tools to the table. Not only does it have a utility designed to help you get your water to match a different profile, it has tons of profiles built right in. This includes profiles for some of the most popular bottled waters. So if you use bottled water, the profile may already be in there for you to use as a starting point. Nobody likes doing data entry, so BeerTools Pro comes with hundreds of the most popular ingredients on the planet. This will minimize the time spent searching for the specification data on your ingredients and let you focus on having fun. If you find one you would like to have included, let us know. Additionally, BTP keeps track of your Inventory for you. It all comes down to recipes. That's why people buy brewing applications. BTP has a robust recipe management system. BeerTools Pro also comes with access to over 7500 recipes from the BeerTools.com website interface, allowing direct transfer of 5 recipes per month from BeerTools.com to BeerTools Pro for free, or alternatively 50 recipe transfers from BeerTools.com to BeerTools Pro with our GOLD membership (Internet connection required to download recipes). Among these are award winning recipes from around the world. It also means that recipes that you create at BeerTools.com while at...say your work computer (hypothetically of course) can be downloaded into BTP when you get home. So BTP travels wherever you have access to the web. BeerTools Pro will revolutionize how you think of brewing. It proves that brewing a complex beer can be done without the feeling that you are landing a Boeing 747. The features that we have planned for upcoming versions are pretty slick (and fun). Be prepared to throw your ideas about what brewing software is right out the window. BeerTools Pro 1.5 has arrived! Click here to buy BeerTools Pro. See how BTP lines up with some of the other software offerings out there.